Every once in a while, we teachers are treated to a special snack or small meal by the parents. Usually by 4 or so in the afternoon, we’re pretty hungry and will descend on anything like a college frosh in the cafeteria. Today, we received some pizza from Pizza Hut. I bet you’re thinking, what’s so special about pizza from PIzza Hut, right? WELL – I’m glad you asked…this was unlike any pizza I’d ever seen before! 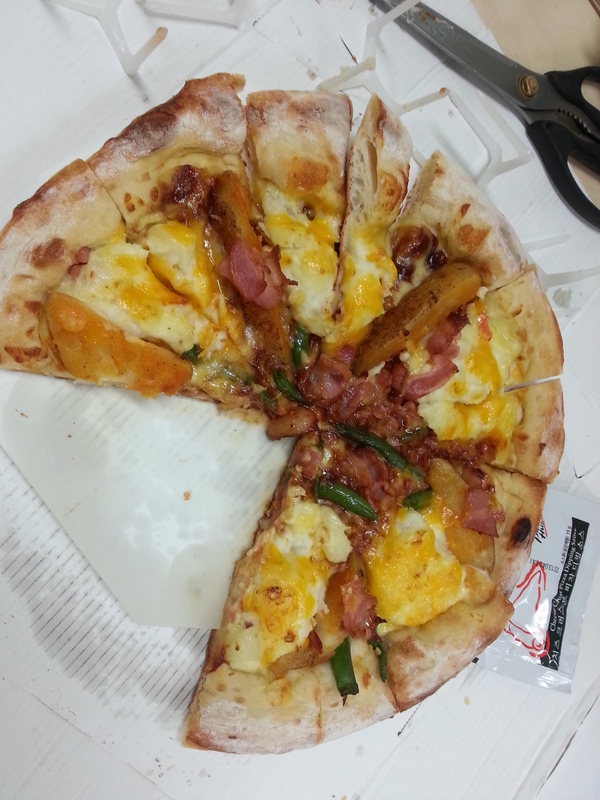 On this pizza, there was something akin to bacon, potato wedges, eggs, BBQ-like sauce and whole green beans. It was an odd assortment of toppings, yet, quite delicious. I’d been craving pizza for a while, and this totally hit the spot. Next Post First “Real” Salad in Months!! I’m impressed by the pizza, but I’m more impressed by the fact that the parents bring you treats and stuff! After almost 8 years here where things like that just don’t ever happen, I’d forgotten about the things the PTA used to do for us at OP. I’d eat that. Maybe only once, but I’d definitely try it. As long as they don’t put fish of any kind on there, I can’t imagine it would be all too bad.